When it comes to breakfast, cereal seems like a no-brainer. It's quick to make and eat. But you don't have to limit cereal to just breakfast time. Cereal, as long as you choose a healthy variety, makes a good choice even at night, whether you're eating it for dinner or as a snack. Not all breakfast cereals make a good choice. When looking for a healthy cereal choose one that lists a whole grain as the first ingredient, such as whole wheat or whole oats. You also want to watch the sugar content. Look for cereals that have no added sugar or less than 11 grams of sugar per serving. And go for cereals that are high in fiber -- at least 4 grams of fiber per serving -- to help maintain blood sugar and keep you feeling satisfied. 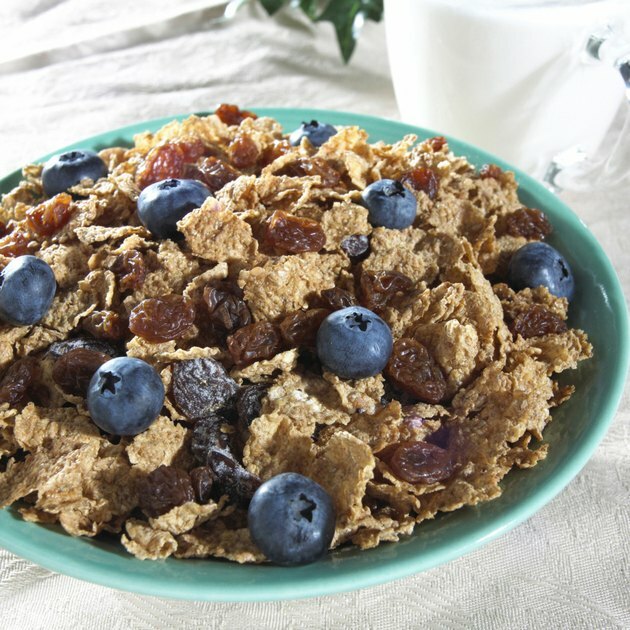 Some cereals, namely granola, may be high in fat, so look for varieties with less than 3 grams of fat per serving, and keep a lid on sodium, choosing cereals that have less than 360 milligrams per serving. Also, check the food label for serving sizes and use measuring cups when dishing out to control calorie intake. Add nutrition and natural sweetness to your evening bowl of cereal with fresh, frozen or dried fruit. Sliced banana or strawberries and fresh or frozen blueberries make nutritious additions to your dish of cold cereal. If you like hot cereal at night, dried fruit and nuts add both texture and flavor. Whether you use cow's milk or a milk alternative such as calcium-fortified soy milk, use low-fat or fat-free varieties to help manage both calories and fat. If you're trying to control your calorie intake to help lose weight or maintain a healthy weight, replacing your usual dinner with a bowl of cereal may help. However, like any good diet plan, it only works if your daily calorie intake is balanced or reduced to produce the results you desire. Use small bowls for your cereal and milk so it looks as though you're eating a lot, which is especially helpful when limiting calories for weight control. Eating cereal as an evening snack may also help with weight control, according to a 2012 study published in the "International Journal of Food Sciences and Nutrition," especially for those who like to snack at night. This study found that when a group of overweight individuals ate a bowl of cereal after their evening meal in place of their usual snack, they ate fewer overall calories. So, if you're feeling hungry after dinner, enjoy a bowl of whole-grain, low-sugar cereal instead of a bowl of chips or ice cream.